And so to a new season. Notts were already in credit thanks to a popular return to the black and white stripes (see below) and a sneaking suspicion that maybe, just maybe, Notts were about to begin a realistic challenge on the promotion places. Curle had surprised a few doubters with an end of season run-in that was unlucky to fall just short so what better way to celebrate the 150th anniversary than with an exciting new side playing free-flowing football.....Amazingly enough, that was exactly what happened. The usual wholescale changes of personnel had seen departures - stalwart Mike Edwards most notablly. He left for a longer deal in Carlisle. However there were exciting arrivals too, with Campbell-Ryce offering power and speed and Zoko and Showumni filling the difficult forward slots. The new influx meant Hughes lost his number 9 shirt and this seemed to point to an early exit for the seasoned striker who eventally found his form for Port Vale.After an encouraging start from the new side though, promises and passing floundered in the quagmire of a long and dirty winter. The ground was hopelessly chewed up and continual low temperatures and rain took their toll on a pitch also ploughed up by egg-chasers as yet another manager came to grief in the unclement weather of an English winter. Despite this, individual players shone though,like Alan Judge 'the Irish Messi' and Campbell-Ryce, who worked tirelessly on the wings to feed the forwards.Notts initial impetus dried up though and the early season highs gave way to disilussionment that got mired in mid-table . Even the proposed and eagerly-anticipated Juventus return fixture turned into another Legends game as stars of the stage version of David McVay's 'Steak, Diana Ross' competed with Notts favourites of yester-year. Great as it was to welcome such names to Meadow Lane thoughout the season, the sight of guest Mark Stallard, warming a seat in the Pavis whilst another lack-lustre performance was played out on the pitch seemed indicative of the oldest club's inability to find and retain the quality needed for the push to the next level. An ignominious defeat to Leyton Orient ended the teams record-breaking, undefeated 22 game away game run although it did provide a timely moment for Fabien Speiss, the young 18 year old German keeper to come off the subs bench and show just what a confident performer he was. With the pressure mounting on his manager though, it was only a matter of time before the merry-go-round was once more cranked up. Curle departed and Chris Kiwomya stepped into the hot seat whilst it was still decidedly warm from its last incumbent. A 4-1 TV win against Bury gave him an early present and might have tempted disappointed fans back but it was the gradual introduction of youth, in the form of Hadyn Hollis, Waite, Tempest, Thompson and Nangle (the latter of whom scored on his debut) that showed the triumph of enthusiasm over older heads and allowed the team to end the season on a high. Once again, though, the talk of economy and player budgets dominated at the end of term with much resting on the new manager to take the team forward and create a new squad from the misfiring remnants of the old. The long-awaited 150th anniversary shirt was similar, although not exactly, like last season's fore-runner. The plain black and white was adorned by gold adverts, even the Fila logo - a master-stroke of design that kept it all to traditional Notts colours. The badge had an additional logo underneath commemorating the date. By the close of season, the usual run on shirts was already making the replicas collectors items. For the 150th anniversary of the club, it was obvious that something special was required. Notts duly came up with the goods in triplicate. A decent black and white home shirt was adorned with gold advertising. Even the manufacturers marks were gold on the sleeve. There was a salute to the club's historic past with a striped top and finally, a very popular pink - one for the ladies perhaps ! 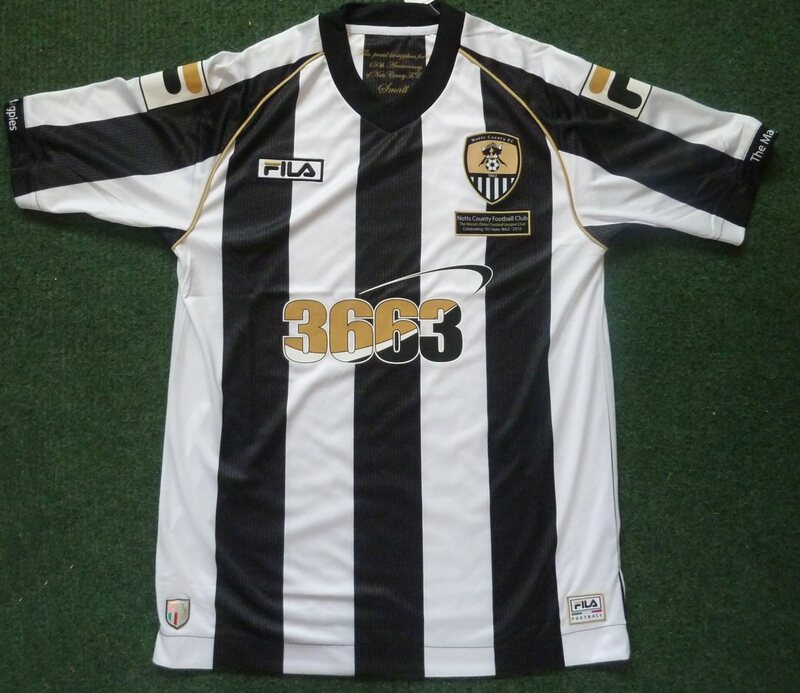 Certainly it proved very popular and already prospective gold diggers are asking three figures for replicas from those without the foresight to have bought early.The home shirt also came adorned with season ticket holders names on the black stripes which may have encouraged prospective purchasers and Fila turned out a remarkably decent kit in the second year of their deal. Check out our seperate page for more pics and details. The second shirt (at least in name as it proved the least popular of the three). This one belonged to Jamal Campbell-Ryce, one of Curle's imports at the start of the season and was sold off by the club at the end of the season.